Do you answer your phone everywhere you go? Do you feel like social media channels are invading your personal space? Take a break from your online networks! 25 Social Media Pet Peeves – How Many Are You Doing? Do you have a social media pet peeve? Are you irritating others with your activities online? Check out these 25 social media pet peeves. Do you send automated direct-messages to your followers on Twitter? If so…please stop. It’s one of the most annoying Noob habits in social media. Social Media Comic: Do You Really Need All Those Gadgets? Mobile technology and social networking have certainly converged and are helping us stay in touch. But do we need to be “always on and always on-call” in our lives? Does the social/mobile connection actually cause issues? 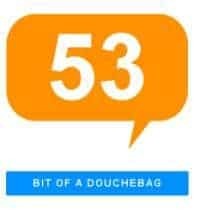 Klouchebag.com lets you determine how big of a social media douchebag you really are. Let’s face it…sometimes things go wrong. Communicating with your customers about issues that arise and letting them know what steps you’re taking to resolve can go a long way. Frustrated by a slow computer? Try cleaning up your hard drive and running a defragmentation utility to speed things up. Pinterest continues to draw traffic, offering significant advantages over Google+. But can they stay out of legal trouble over copyright law?